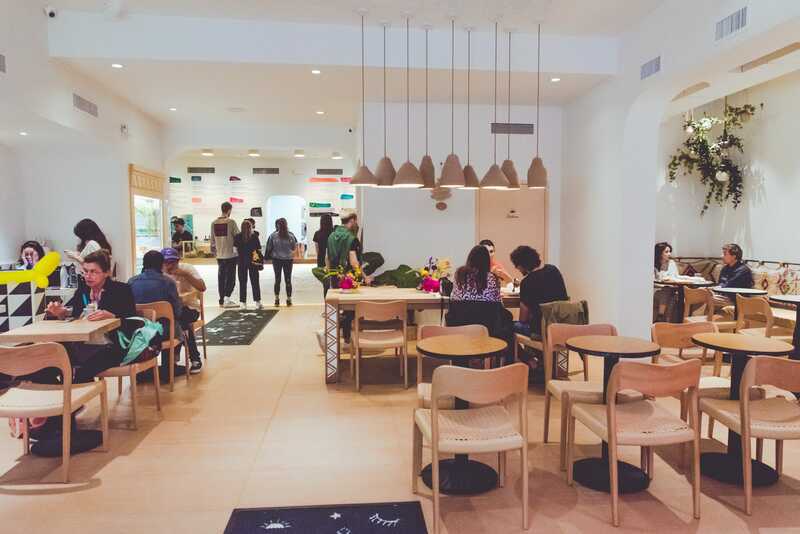 The co-founder of By Chloe, the chain that wants to be the McDonald's of vegan fast food, just opened a new restaurant. Here's what it's like to eat there. 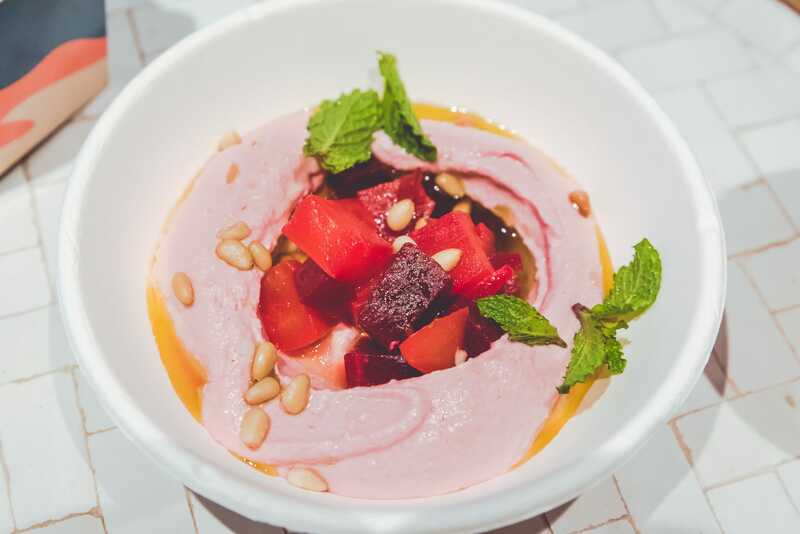 Business Insider/Jessica TylerOne of the signature dishes at Dez is beet hummus with pine nuts and mint. Samantha Wasser, co-founder of the international vegan fast-casual chain By Chloe, just opened a new Middle Eastern restaurant called Dez, which is short for desert. The food served at Dez has some very personal touches. “[The food] is exactly the way [Eden] would prepare it for you if you came to her home,” founder Sam Wasser said. 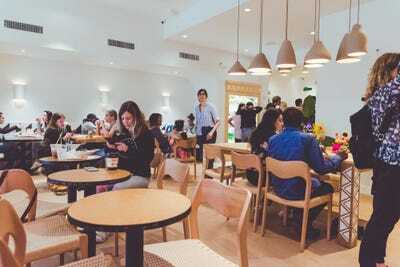 By Chloe, a vegan fast-casual chain, has become an international success since opening in 2015. The chain now has 10 stores, including a new location in London, where another is on the way. 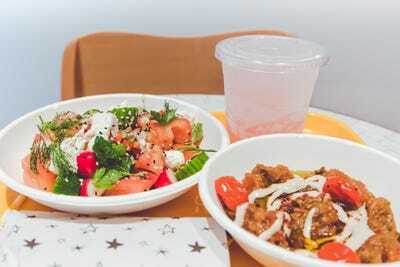 By Chloe co-founder Samantha Wasser recently opened her latest fast-casual spot, which is in collaboration with chef Eden Grinshpan, who hosts the Cooking Channel’s “Eden Eats.” Called Dez, short for desert, the restaurant serves up a mix of Middle Eastern food, including dishes like Moroccan lamb meatballs, harissa curry shakshuka, and falafel cauliflower pita. Though Grinshpan had been sitting on the concept for a couple of years, the idea to open a restaurant came about after she hosted a pop-up in Brooklyn. She received so many positive responses that within weeks, she was meeting with Esquared Hospitality, which also operates By Chloe. 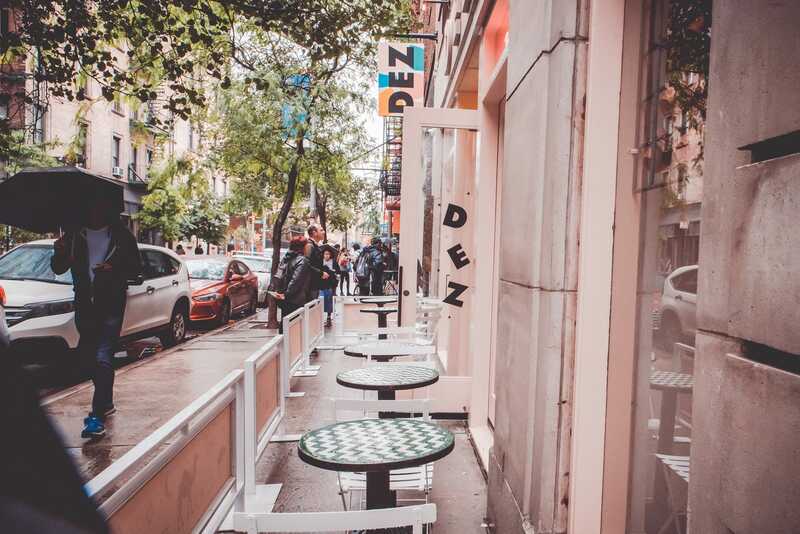 The menu at Dez took more than two years to come together. 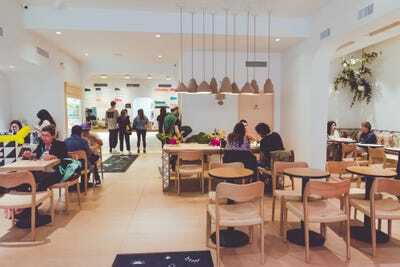 The prices are relatively low, with meze costing $US6 and salads priced at $US11. Grinshpan, who is half-Israeli, said the Middle Eastern concept hits close to home. While this is Grinshpan’s first restaurant, Wasser is clearly no stranger to the fast-casual industry. The hope is to appeal to millennials in much the same way that By Chloe does, and to eventually grow Dez’s presence elsewhere. 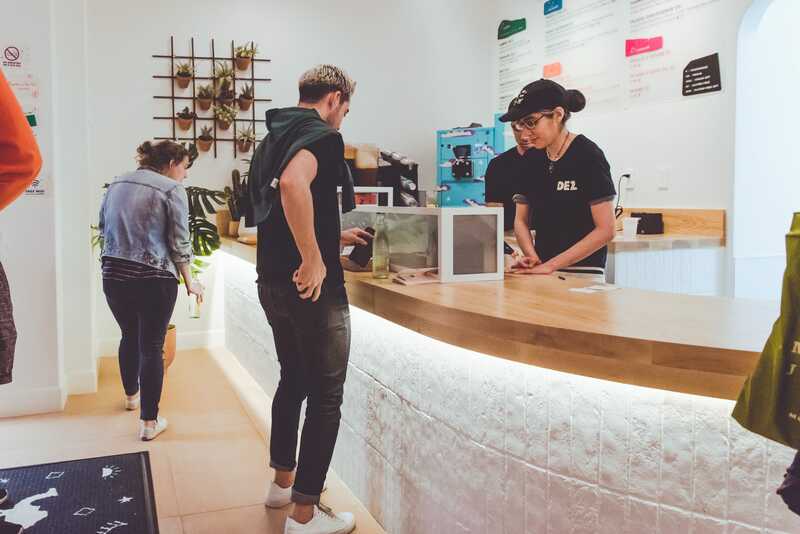 “What I love about the fast-casual industry right now is that it’s pretty much designed for me and my peers, and millennials as well, where people want delicious food that is well-sourced and well-curated in a high designed space. And that’s kind of where fast food is lacking,” she said. Dez is located in Soho, just around the corner from By Chloe. It was pretty busy considering that it had only been open for two hours when I visited. 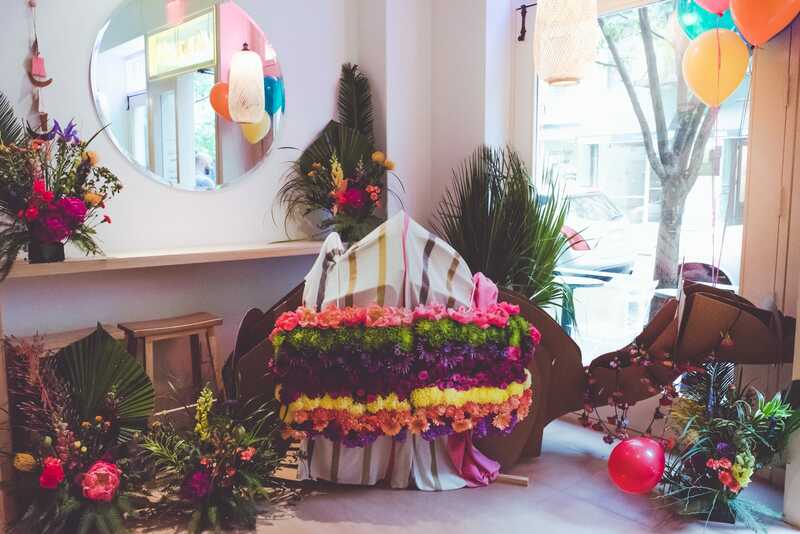 There were colourful decorations and plants throughout the interior, and a cardboard camel decorated with flowers sat in the front of the restaurant. While designing Dez, Wasser placed an emphasis on creating a well-designed space. “I think more people are going to be paying attention to the setting and the packaging. People want to have fun when they’re eating,” she told Business Insider. 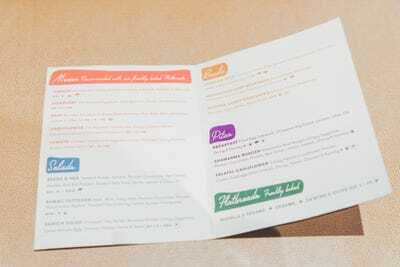 When I walked in, I was handed a mini menu so that I would know what I wanted by the time I got to the counter. 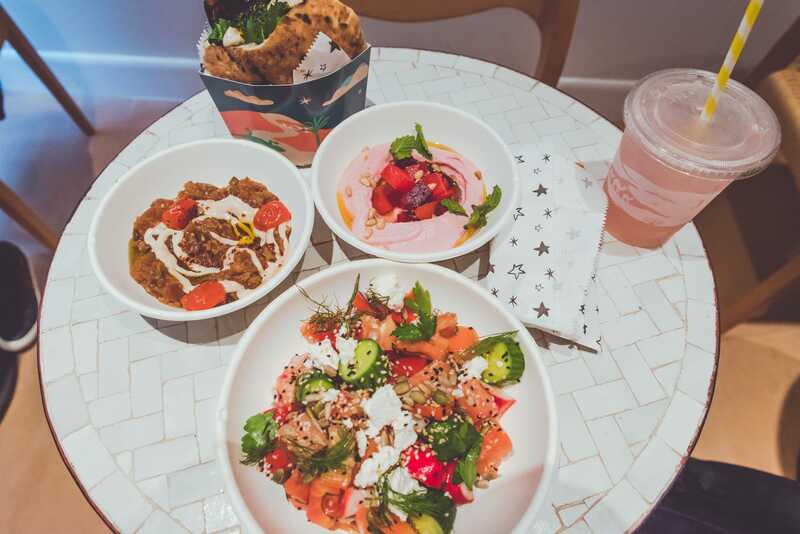 There were meze (appetizers), salads, bowls, pitas, flatbreads, and a brunch menu for Saturdays and Sundays. Everything on the menu was marked as vegetarian, vegan, gluten-free, nut-free, and so on. 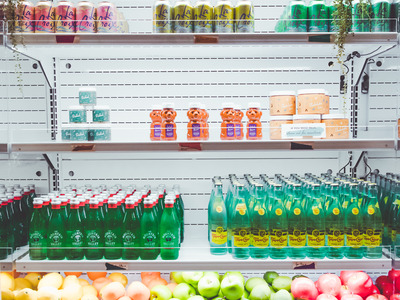 There was a cooler next to the line that had cold drinks, fresh fruit, and a few other small food products. The perimeter of the cooler was artfully decorated with plants and vines, as was much of the restaurant. Also by the register were a mobile pickup shelf and a merchandise display. 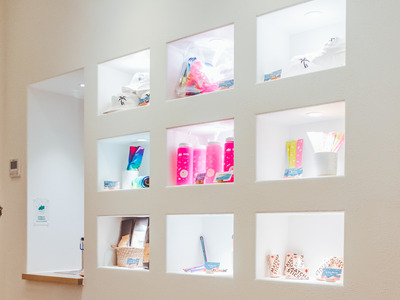 Dez-branded, colour-changing pencils and water bottles, slap bracelets, bucket hats, and tie-dye t-shirts were all for sale. One customer pointed out how everything felt like it was from the ’90s. The line moved surprisingly fast. Instead of calling out your name or order when your food is ready like a lot of fast-casual restaurants do, you get a text when your food is at the pickup counter. I ordered the Seeds & Veg salad, Tomato Meze, and rose lemonade. Everything was bright and colourful, and the flavours went perfectly together. 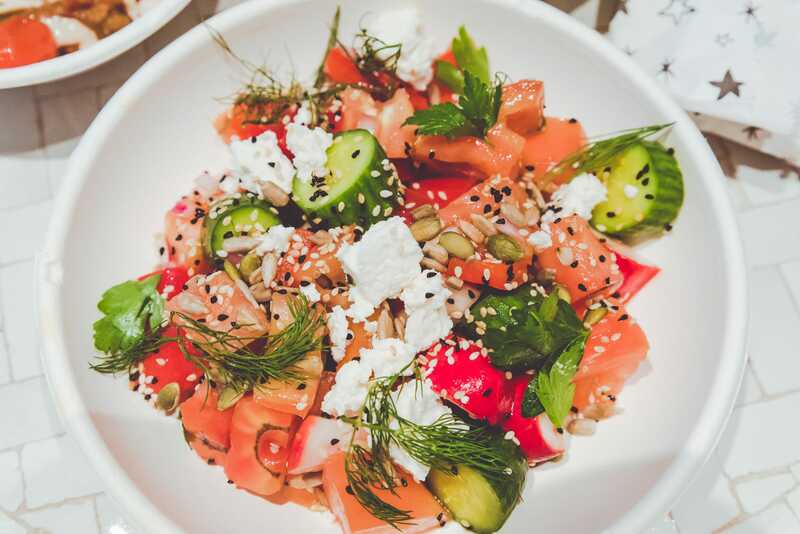 The salad, which cost $US11, was a twist on a traditional tomato and cucumber Israeli salad, and everything in it tasted very fresh. 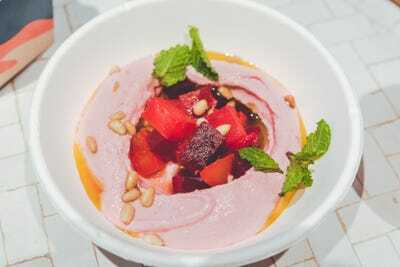 The menu put a spin on things like hummus by making it bubblegum pink with beets. Like the salad, it tasted fresh and delicious. It cost $US6. “Middle Eastern food is really meant to be shared, and the entire menu I feel really goes well together,” Grinshpan told Business Insider. Looking around, people seemed to be sharing huge orders and mixing and matching things from the menu. The restaurant had a similar atmosphere to By Chloe, with made-for-Instagram decor and a constant stream of millennials in and out of the restaurant. Loud music was playing, and people were talking to strangers sitting at neighbouring tables. It was a fun atmosphere to eat in. As for what’s next, the founders told Business Insider that expansion could be on the horizon. “Dez would be incredible in so many different places. 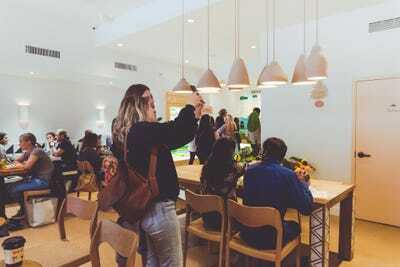 There’s definitely that excitement there, and I think that when you put together a fast-casual concept that is obviously the end goal – to scale it and to bring it to as many places as possible,” Wasser said.